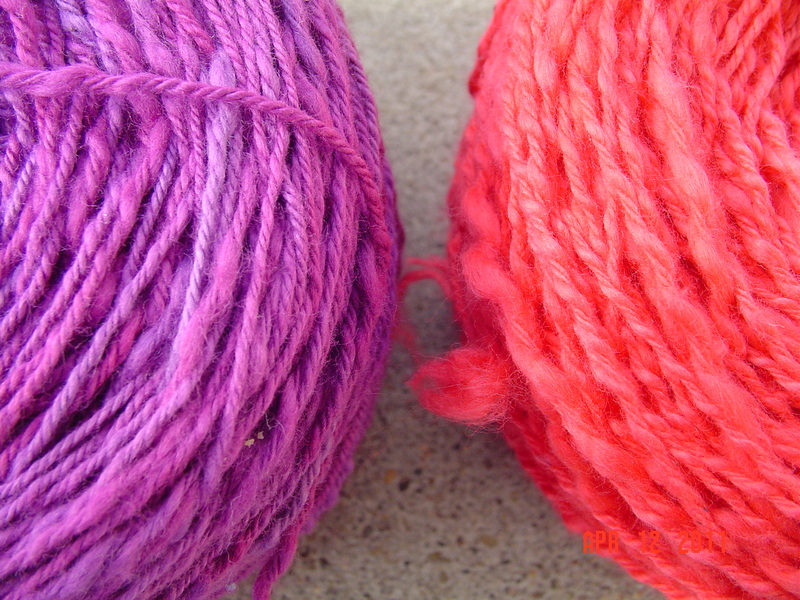 As I mentioned, I’ll be doing a dyeabolical cotton slub comparison in the upcoming weeks. Meanwhile, I’ll still have to work on the sweater commission which has already been started. I plan to devote 2 nights a week to the commission, and call it a wrap. Other than that, I’ll be working on the cotton project. While I had mentioned that I would be finishing up my grover cardigan over the weekend rather than starting on a new project, I couldn’t help but ball up some of the yarn. In my defense, Saturday was far too hot to work on a fuzzy sweater. Doing so made me look like I was turning into grover myself. I mostly spun, but balling up the yarn and then starting on Bug’s cotton top seemed wise. 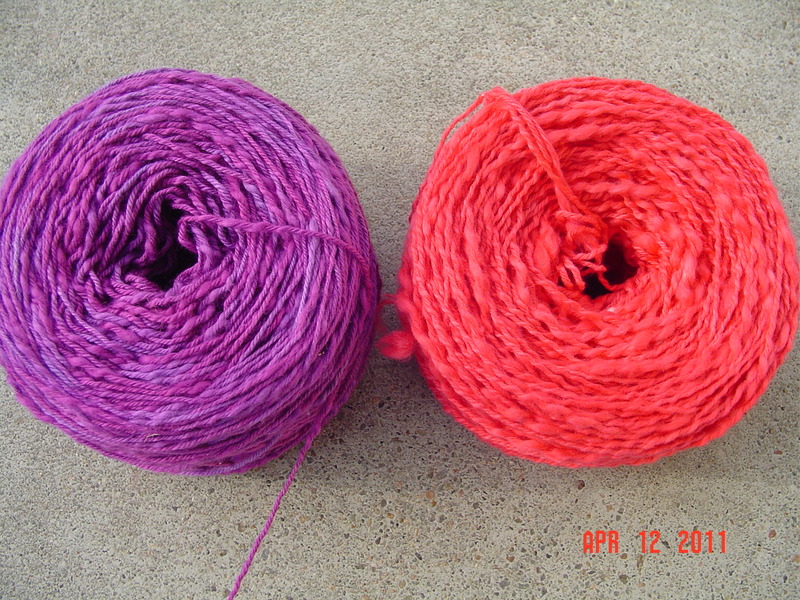 I’ve done pictures of the balled up yarn so you can see the differences. The purple does seem far thinner than the dk weight cotton slub. I would also say that the red seems slubbier overall. I’ll have to see what I think once I start knitting with it. I couldn’t start the Amiga over the weekend because I had not printed out the pattern. 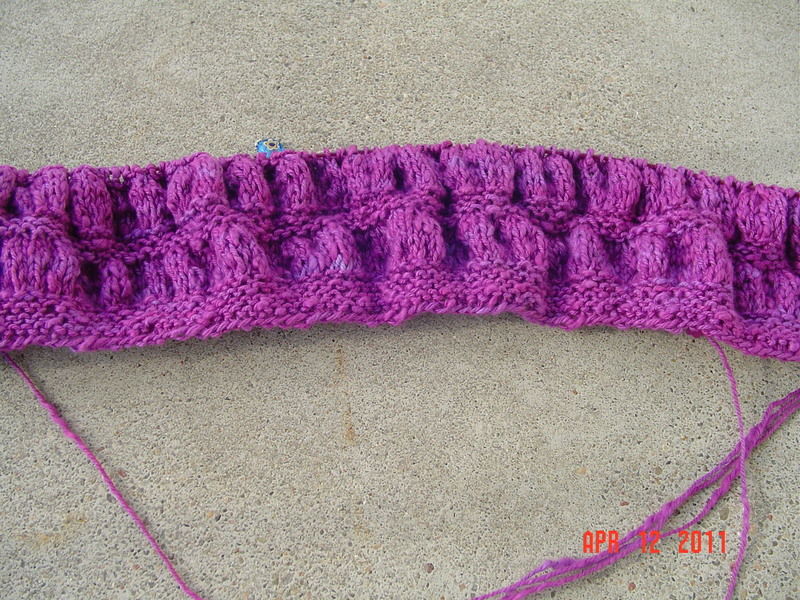 So instead I started on Bug’s top, which is the Child’s Ruched Tee from Interweave Knits Spring 2011 issue. To be perfectly honest, I am not positive I have enough yarn to complete this top, but I think my sassymetrical is too long, and I am willing to shorten it in order to finish Bug’s tee. I’ve actually managed to knit another ruched repeat since this picture was taken. Thus far, I find that I love knitting with the unavailable cotton slub just as much as I loved it last year. This is not a surprise. It just makes me sad.